So, two things. First, had a blast at the fundraising fashion event, Modified Style Portland. 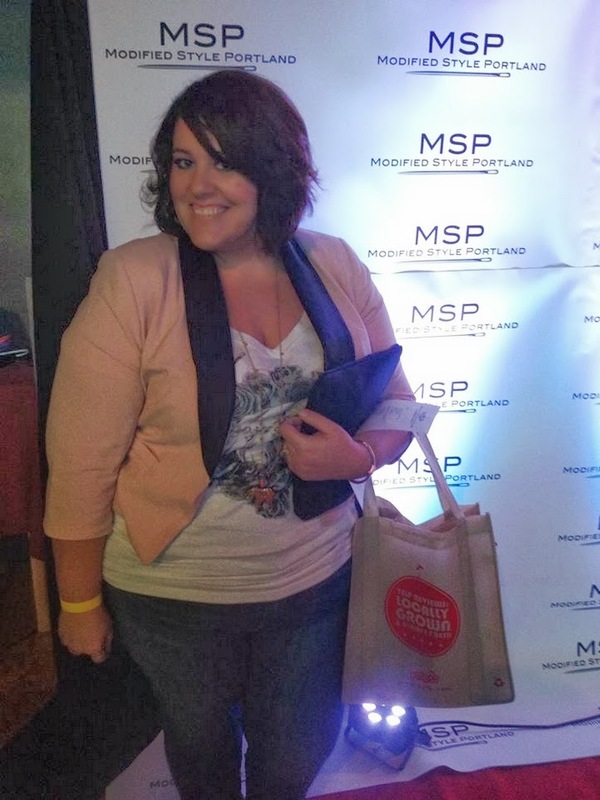 Thank you to the MSP team for the amazing front row seats and swag bags, they had the best bags ever! And second, I fit into a pair of Lucky Brand Denim. Yes, Lucky. I know right? When I met the Lucky Brand ladies at Portland Fashion Week, they were an exhibitor and hosted private style sessions with the PFW Style Collective, she told me they started plus and were trying to get the word out. I of course thought their 'plus' would be something like max size 20 or something? NOPE. I am wearing the Weekender in size 24 below - and normally right now a 26 at Torrid....so they definitely are not the small type of plus you can't relate to. I was baffled?! And, now can't stop wearing these jeans. Thank you Lucky for helping out the big girls and being true to size! Since I was going for the cool vibe, I topped off the jeans with a perfect Torrid graphic tee and blazer from Forever 21+. Sandals courtesy of Barefoot Tess!